The TriVisc viscometers are controlled through an easy to use Windows interface. The connection is made via USB connection. There is an advanced sample management and queuing system built into this interface. The technician begins a sequential sample batch by entering the Start and Stop ID. The software handles any prefix and formatting options your lab requires. Screenshot of the TriVisc control software. Sample management and instrument control are done through this easy to use interface. 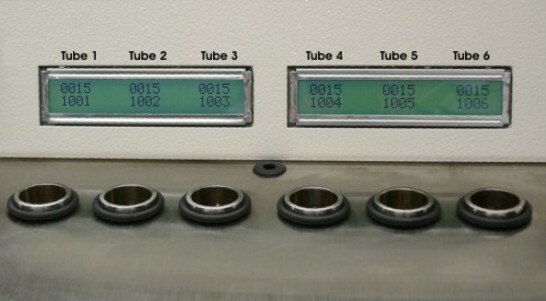 The software automatically queues sample IDs to the LCD display on the TriVisc viscometers. The technician does not need to type sample IDs, or push any buttons. A quick injection of the oil sample is all that is required. Everything else is automatic. There are six tubes in each TriVisc, so while a technician is injecting oil samples, the TriVisc can be measuring or cleaning the other tubes. The system is so efficient that there is no need to wait for all the tubes to finish cleaning before you resume injecting samples.